Hillary Clinton took a veiled swipe on Thursday at Donald Trump, calling recent inflammatory comments Trump made about Mexicans particularly inappropriate in light of the shooting in Charleston that claimed nine lives on Wednesday. Trump, who rarely declines an invitation to a verbal food fight, fired right back, saying Clinton "just blamed me for the horrendous attack that took place in South Carolina." When he launched his Republican presidential bid on Tuesday, Trump declared that the U.S. "has become a dumping ground for everybody else's problems," singling out Mexican immigrants as an example. "When Mexico sends its people, they're not sending their best," he said. "They're sending people that have lots of problems...they're bringing drugs, they're bringing crime. They're rapists. And some, I assume, are good people." On Thursday, during a campaign visit to Nevada, Clinton condemned Trump's remark without mentioning the business mogul and reality TV star by name. "I think decent people need to stand up against it," Clinton added. "We have to speak out against it. Like for example, a recent entry into the Republican presidential campaign said some very inflammatory things about Mexicans. Everybody should stand up and say, 'That's not acceptable.'" "Wow, it's pretty pathetic that Hillary Clinton just blamed me for the horrendous attack that took place in South Carolina," Trump said in the video above. "This is why politicians are just no good. Our country's in trouble." 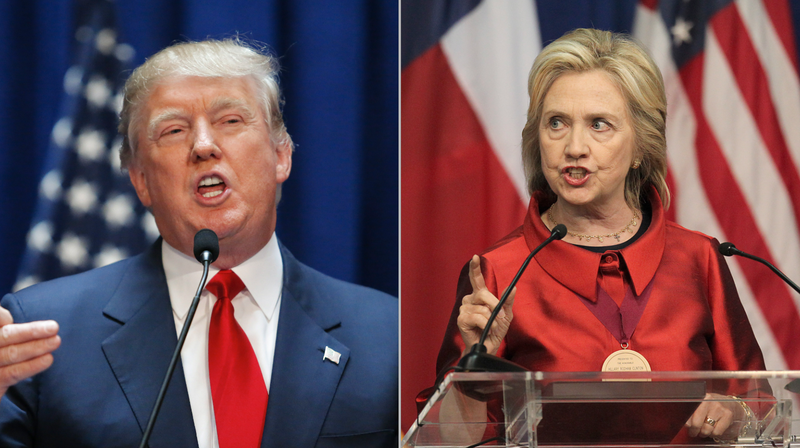 Both candidates condemned the attack in Charleston shortly after it occurred. In a statement, Trump offered his "prayers and deepest condolences are with the people of Charleston and the families of those who have been torn apart by this senseless act of violence and hate." Clinton first spoke about the Charleston Massacre during a speech in Las Vegas on Thursday. "The shock and pain of this crime of hate strikes deep. Nine people--women and men--cut down at prayer. Murdered in a house of God. It just broke my heart. That of course is the last place we should ever see violence. We shouldn't see it anywhere," she said. "In the days ahead we will once again ask what led to this terrible tragedy and where we as a nation need to go. In order to make sense of it, we have to be honest. We have to face hard truths about race, violence, guns, and division." The Department of Justice has launched an investigation to determine whether the shooting in Charleston was a hate crime. The alleged gunman, 21-year-old Dylann Storm Roof, was white. His victims, who were participating in a Bible study at an historic black church in Charleston, were black.